“Rain, rain go away! Come again some other day!” A nursery rhyme I’ve sung on many occasions. Rain ruins plans for picnics, baseball games, outdoor weddings, etc. Rain can reign over our plans for the weekend like it is doing in the Philadelphia, PA area currently. But instead of focusing on how rain can put a damper on the weekend, let’s try to focus on the positive side of the rain. At least it’s rain and not more snow. Rain will help to wash away any remaining snow. It is great for those spring flowers that will be blossoming soon. Without rain, we just might have a water shortage. You get a free car wash. Rain gives us a chance to use that nice raincoat, umbrella or pair of galoshes we purchased. You’re never too old to run in the rain and splash in the puddles with that nice raincoat, umbrella or pair of galoshes. 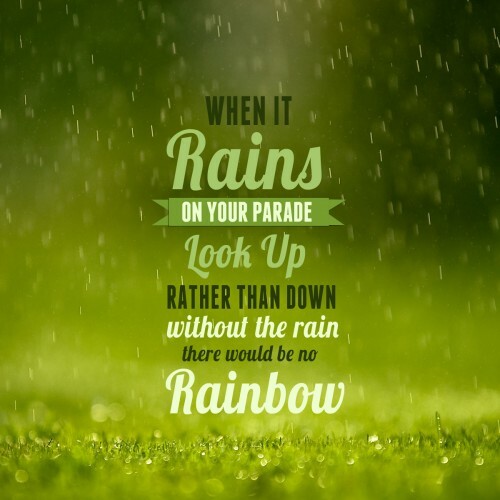 The rain allows you to have a greater appreciation for the sunshine. You just might see a rainbow once the rain has ended. Are rainy days already reigning over your plans? Hopefully one of my reasons will help to make your day a little brighter in spite of the rain.